Prime Minister Narendra Modi Saturday said the ruling Congress-JDS coalition in Karnataka and parties alike were inspired by "Pariwarvad" (dynasty) and believed in giving power to even the last member of the family. Addressing a massive rally here, Modi said unlike the Congress, JDS and others, inspiration for the BJP came from "Rashtrawad" (nationalism). 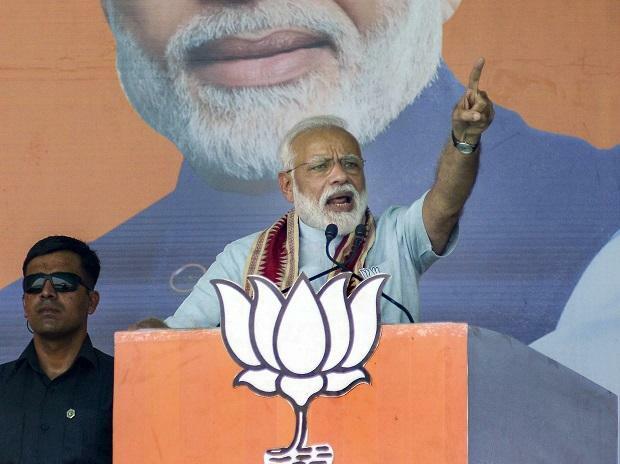 Modi said the Lok Sabha polls was not about who became an MP or prime minister or minister, but about how the "New India" should be and what should be its inspiration. "Inspiration of Congress-JD(S) and parties like them is pariwarwad (dynasty) and our inspiration is rashtrawad (nationalism). They look for ways to give power to even the last member of their family while we are striving to bring those people ahead who are in the last line of society." "Their darshan is vamshoday, while ours is antyodaya (uplifting the weaker sections of society). Because of their vamshoday there will be corruption and injustice and because our antyodaya the glory of transparency and honesty will increase", Modi said. Continuing to target the dynasty politics of Congress on the second consecutive day of his campaign in Karnataka, Modi said, "this vamshoday will ignore their own party senior leaders, while our antyodaya will make a tea seller the Prime Minister...."
Pointing out that BJP's "antyodaya" respects unknown faces of society, Modi said five years ago who could have thought that someone serving people in a tribal area or conserving species of vegetation would get an honour like Padmashri. "This difference has happened. When I see the elderly people with torn chappals receive Padmashri with pride at Rahtrapati Bhavan, I feel this is my true India," he said. The Prime Minister said it was "regretful" that the Congress after Independence did not give "Bharat" the kind of administration it deserved. "The 20th century gave Congress an opportunity but it dedicated it to one family and lost the opportunity," he said. Noting that a memorial in the name of Abdul Kalam had been built in Ramanathapuram, he questioned why such memorials were not made for former President Radhakrishan and other presidents, when Congress built memorials for its family members. "It was only their family affair..."
"Now 21st century is punishing Congress for its mistakes," he said. Attacking the Congress over national security, he said their behaviour depicts their attitude towards the country's armed forces. "When surgical strike happens these people ask for evidence. Do you believe our soldiers and their bravery or not? Is evidence required for our brave?" "When India kills terrorists entering their homes... these Mahamilavati questions army's feat. They have fallen to the level of calling the country's army chief "gali ka gunda". These people should be ashamed or not, but will they be ashamed? ", he asked. Referring to his Kerala visit on Friday, Modi said the situation there was such that under the Communist government which is part of 'Mahamilavat', no citizen can even take the name of Lord Ayyappa publicly. "You will be put behind bars for taking the name of Sabarimala. The constituency I visited yesterday, the candidate there was put behind bars for 15 days. He was released on bail yesterday," Modi said. Alleging that the "Mahamilavat's Congress culture" has not only harmed the country's traditions, but also weakened 'our' defence and has not left any attempt to destroy the economy, he said, "They had left our banking sector on ventilator in 2014." "Congress' namdars played the game of phone banking, banks were ruined. The amount of loan the banks gave since freedom to 2006 for 60 years...these people from 2006 to 2014, have given double that. The amount of commissions that came out, we will get to know from investigation..."